We’ve touched in these pages — one of our earliest posts, in fact — on Soviet war heroine Zoya Kosmodemyanskaya, a teenager executed by the advancing German army in November 1941 for conducting partisan attacks behind enemy lines. Zoya’s story became known after the Red Army recaptured village of Petrishchevo, where she was hanged. A January 27, 1942 Pravda article recounted the gallows defiance of the young guerrilla, whom villagers knew only by her nom de guerre, “Tanya”. She had withstood German torture, refused to give them any information, and at her hanging incited her countrymen and -women to resist the invaders. She’s still to this day a beloved national martyr in Russia, which is why she’s also an Ace in our execution playing cards. The young woman on the gallows, and in the ghastly post-mortem pictures with her left breast mutilated swiftly became propaganda grist for Moscow. Zoya’s instant Joan of Arc-like legend invited investigation of the precise circumstances of her capture and death … and this in turn meant extremely dangerous scrutiny for any Soviet citizen in her environs whose behavior in those last days could be held to be in any way sub-heroic. This brings us to today’s unfortunate entry, Vasily Klubkov, a humble mail-sorter before the war whose picture belongs in the dictionary next to “poor luckless sod.” Just him, Zoya, and everyone else on the terrible Eastern Front. It was on this date* in 1942 that Klubkov paid the penalty for Zoya’s sacrifice. Vasily Klubkov and Boris Krainov were other partisans who had been detailed along with Zoya Kosmodemyanskaya to torch some enemy assets on the same mission around Petrishchevo. Practically children all, they each acted independently from the others; long story short, Zoya and Vasily Klubkov were both captured. Zoya fiercely endured every torture the Germans could throw at her, but Klubkov was made of softer stuff. When an officer pointed a gun at his head and demanded some answers, Klubkov started talking. Now, this admission very much against his own safety was made to the NKVD in March 1942, and since we already know that Vasily Klubkov was the sort to fold under torture, we can well imagine that the NKVD also got whatever it wanted out of the misfortunate young man. Considering the politicized quality of the trial and the circumstances of the “confession,” it has to be treated with caveats. 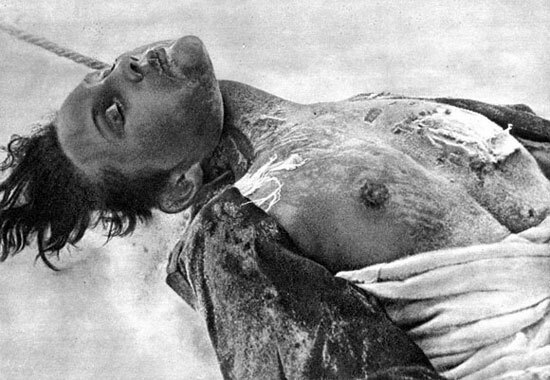 Under NKVD pressure, Klubkov signed off on a version of events that just so happened to mesh beautifully with the iconography already forming around the hanged “Tanya”: namely, that he was brought face-to-face with his fellow-prisoner and confirmed her identity, whereas she refused to breathe a word to her captors; that he saw her stripped naked and bashed with truncheons for hours and still summon the fortitude to refuse her interrogators the least satisfaction. 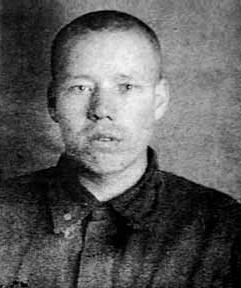 Pavel Klubkov gave posterity firsthand evidence of Zoya Kosmodemyanskaya’s heroism in captivity. Heck, the reason the NKVD even had Klubkov to interrogate was that he escaped German custody, another big character red flag as far as the Soviets were concerned. That he escaped from the same custody that martyred Zoya Kosmodemyanskaya probably sealed his fate before he received his first pistol-whipping. NKVD records paint a kid who has already given up. * Though there are some cites for April 3 out there, it appears that April 3 was the date of his conviction by a military tribunal and April 16 his execution date. This is a bit of a protracted delay by wartime Soviet tribunal standards, but then, Klubkov would have been a person of relevance to the state itself. The highest-ranking official who thought he could approve Klubkov’s execution without asking anyone else might have been a little further up the food chain than for your run-of-the-mill deserter.